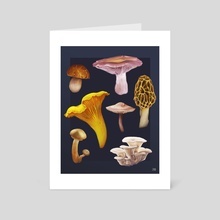 Detailed digital illustration of various mushrooms species. From upper left: Cep, Blewit, Chanterelle, Fairy Ring, Morel, Armillaria, Oyster. 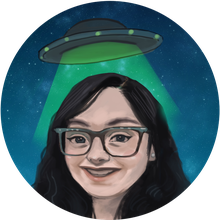 An illustrator and game developer, Jessica creates work that communicates realities beyond our own. This includes influences from the occult, esotericism, folklore, mythology, and nature. She works in both digital and traditional media. In addition to being a game artist and an illustrator, Jessica is also the founder of Sassy Chicken LLC, which she uses to focus on the development of her story (and video game) Bear Who Paints. Her interests beyond creating are drinking ciders, petting her dog, reading history books, and watching Bigfoot documentaries.